All materials are included in the course cost which includes the blank item to be painted, paints, use of brushes, thinners, etc. and handouts and instructions which will be collated and placed in a file for you to take away with you together with your painted item. Lunch and drinks are also included. Paint and brushes will be available for you to purchase at the end of the course. 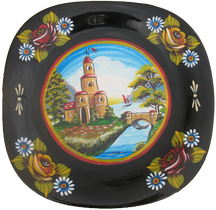 The content of this beginner’s course will be to decorate a wall hanging dinner plate with canal art roses, daisies and a canal art castle scene using enamel boat paint, sign writer’s brushes and the same traditional techniques used to decorate narrow boats. If you have an item you would like to paint instead of a plate, bring it along with you! The morning will be painting roses and daisy bases on the plate rim and preparing the back ground for the castle scene. The afternoon will be decorating the plate centre with a castle scene and completing the roses and daisies with petals. At the end of the course you will have the knowledge to decorate a narrow boat with roses and castles and decorate items for boats such as water cans, mop buckets coat hods etc. in the traditional manner and know where to purchase the correct specialist paints, brushes and materials. No previous experience is necessary and you don't need to be good at art, come along and have a go and have some fun! 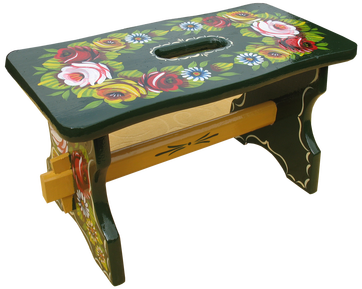 The content of the course will be to decorate a wooden stool with canal art roses, daisies and gypsy brush strokes using enamel boat paint, sign writer’s brushes and the same traditional techniques used to decorate narrow boats. If you have an item you would like to paint instead of a stool, bring it along with you! The morning will be painting roses and daisy bases and the afternoon will be decorating the bases with rose and daisy petals, finishing off with gypsy brush strokes. At the end of the course you will have the knowledge to decorate a narrow boat with roses, dasies and gypsy brush strokes. You will be able to decorate items for boats such as water cans, mop buckets coal hods etc. in the traditional manner and know where to purchase the correct specialist paints, brushes and materials. This course is a good follow up to the decorated plate course but beginners are welcome on this course too. No previous experience is necessary and you don't need to be good at art, come along and have a go and have some fun! 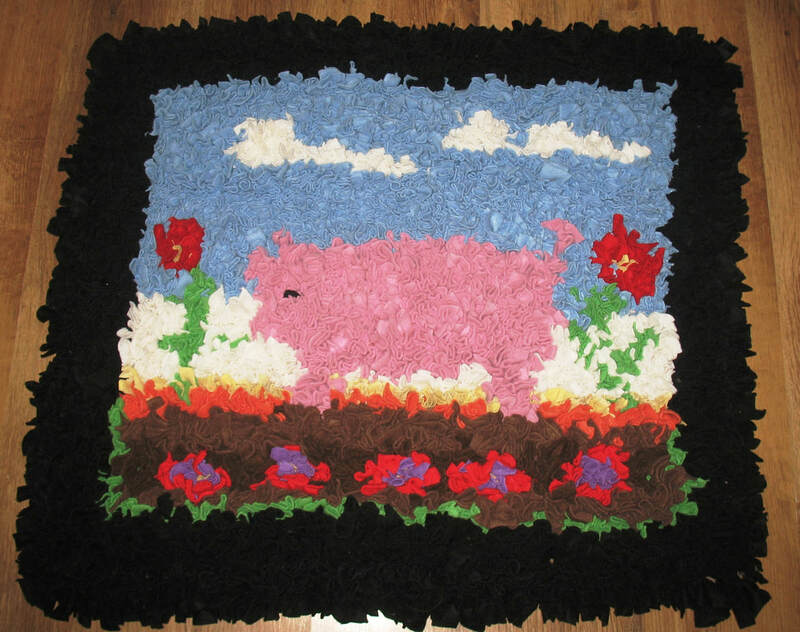 At the end of the course you will have the knowledge to design and create your own progged rag rug and know where to purchase the correct specialist tools and materials. You will also take home a rag rug wreath christmas decoration. Please bring with you any old clothes you can cut up and use, preferably t shirts or fleeces or jogging bottoms. No previous experience is necessary and you don't need to be good at craft, come along and have a go, make new friends and have some fun! Materials and tools will be available for you to purchase on the day. All materials are included in the course cost which includes Hessian, use of rag rugging tool and wooden gauge, use of dress making scissors and rags if you don’t have any. 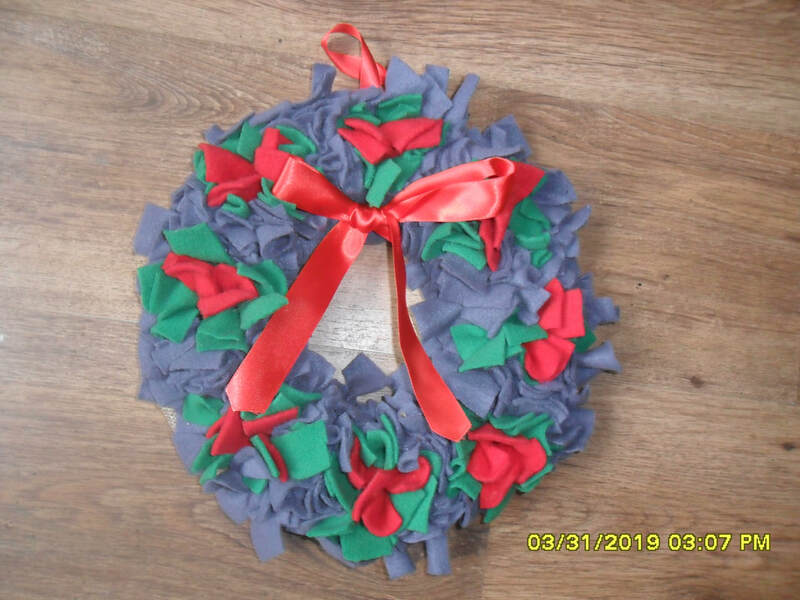 There will be handouts and instructions for you to take away together with your started rag rug and rag rug Christmas wreath. Lunch and drinks are also included.